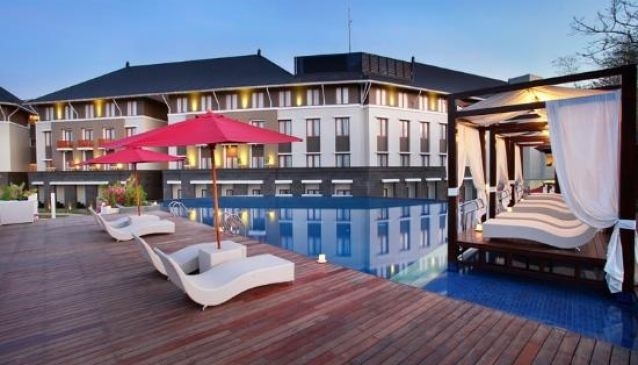 Just 14 km from the Ngurah Rai International Airport, Mercure Bali Nusa Dua offers 201 contemporary rooms, including 8 Junior Suites, 1 Reduced mobility room, 1 restaurant, 1 bar, Fitness centre, a unique swimming pool at the rear, divided over two levels and connected by a waterfall. Lifts to all floors. Mercure Bali Nusa Dua Meeting rooms are ideal venues to hold a special meeting and event. Professional team members are always ready to support a smooth, successful and memorable meeting and event.